I know you have all heard this before in some form or another but this time I’m not kidding. There are many kinds of chocolate chip cookies that are outstanding and I even have a recipe on this site that I’ve already ranted and raved about. But this one, no joke, is THE best. My friend Erica came over the other day and said she would bring cookie dough over to bake for dessert. Who am I to argue? She never said what was in the chocolate chip cookies just that it was a new recipe. Well guess what? These cookies were amazing and I couldn’t figure out what made them so delicious, and nutty and buttery and yummy all at the same time. Was it the extraordinary amount of chocolate chips in the recipe? The butter? The sea salt? You practically don’t need anything else…but she did put something else in and it was shocking and amazing to discover that it was Tahini. That’s right. Sesame butter. That amazing ingredient that makes hummus so damn delicious. 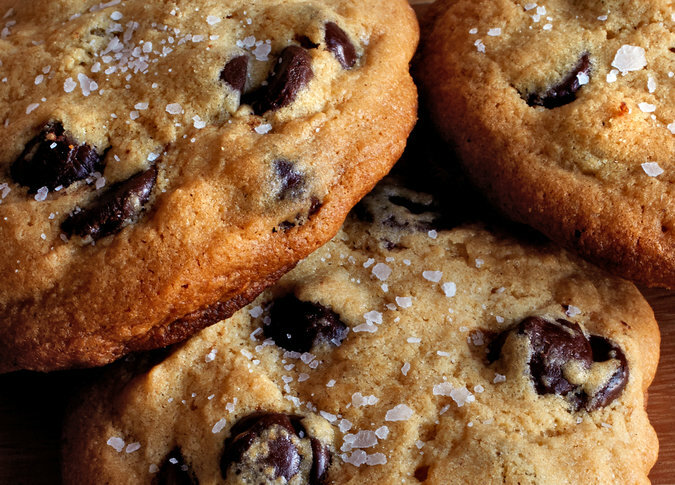 I just say throw away all other chocolate chip cookie recipes and just use this one. It’s THAT fantastic. Thank you Smish for sharing this little gem. Thanks New York Times for sharing this fantastic recipe. You can find the original link and recipe here. I LOVE Christmas stollen. I’ve had an irrational relationship with this festive German nut and fruit cake since I was a kid. Last year I bought and ate two (by myself) before Christmas. This year I thought I would try and make an easy version of this. I found this recipe here (Cinnamon Spice and Everything Nice) and LOVED it. It’s light, delicious and ridiculously easy to make. I made this with spelt flour – and I skipped the candied fruit except for the raisins to make for a slightly less sweet version of this bread. Stollen is a German sweet bread filled with dried fruit and nuts. Preheat your oven to 325°F. Lightly grease a baking sheet or line with parchment. In a large mixing bowl whisk together the flour, sugar, baking powder, and salt. Cut the cold butter into small chunks, then blend it into the flour with a pastry blender or two knives used scissor fashion to form uneven crumbs. In a separate bowl, mix together the cheese, egg, vanilla, and zest. Toss the fruit and almonds with the flour mixture until evenly distributed. Combine the wet and dry ingredients, mixing until most of the flour is moistened. Turn the dough out onto a lightly floured work surface, and knead it two or three times until it holds together. Divide in half. Roll each piece of dough into an 8 x 7 oval about 1/2-inch thick. Fold each piece of dough in half lengthwise, leaving the edge of the top half about 1/2-inch short of the edge of the bottom half. Use the edge of your hand to press the dough to seal about 1-inch in back of the open edge; this will make the traditional stollen shape. Place the shaped stollen on the prepared baking sheet and bake until light brown around edges about 40 minutes or until a toothpick comes out clean from center. Remove the stollen from the oven, and transfer to a rack. Brush each one with 2 to 3 tablespoons melted butter. Sprinkle heavily with confectioners’ sugar. Once the stollen are cool, brush with butter again and sprinkle with sugar. Wrap in plastic wrap until ready to serve. Plastic-wrapped stollen will keep well for 2 weeks or so at room temperature. Thanks to Cinnamon Spice and Everything Nice for sharing this fantastic recipe! My friend Lorraine had a bunch of us girls over for a fantastic dinner a while ago and sent us all home with goodie bags. What happened to be in these goodie bags was her and her sister’s homemade caramel corn. Call me crazy but I have never (ever) had caramel corn in my life. Having no idea how much work this took, I asked Captain Kirk if I could pay her to cook me up a batch for Dave’s birthday. So Lorraine generously obliged and I ended up coming home with the first birthday present that wasn’t returned. Last night we polished off the last few morsels and in some ways I feel relieved, even thankful because I have obsessed steadily for the last week about C. Kirk’s CC. I think about it all day at work and when I come home I think about how I shouldn’t eat all of Dave’s birthday corn, but then I eat some more anyways, trying desperately all the while not to eat all the best bits (but I do anyways) like the candied pecans and macadamia nuts. So I’m just saying, this treat does come with a stern warning – it is equally as dangerous as the Dangerous Rumballs. So make this at your own peril! I haven’t actually made this yet – the version I received used pecans instead of almonds and macadamia nuts instead of something else. I think you can use whatever nut you fancy. Go ahead and try this fabulous recipe. When we’ve recovered from this lot we’re making our first batch! Let me know how it goes. 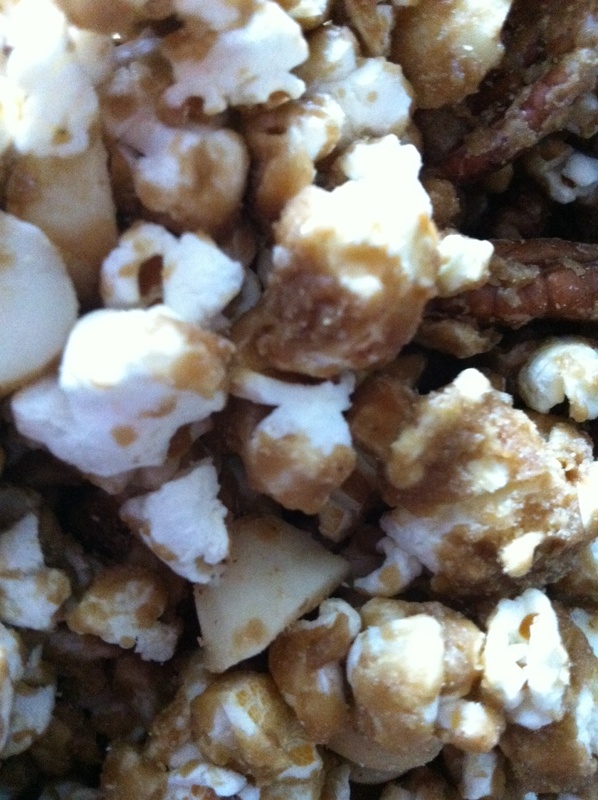 And now without further ado your key to caramel corn fabulousness. And thank you Lorraine for sharing this great recipe – which came from the Globe & Mail. Preheat oven to 250 F. Pop 1/3 cup natural popcorn kernels (about 12 cups popped). Set aside in a large bowl and stir in 1 cup unsalted almonds and 1 cup unsalted cashews. Scrape the beans out of 1 vanilla pod and mix into 1-teaspoon pure vanilla extract. Set aside. In a large heavy bottomed pot melt 1 cup firmly packed brown sugar, 1/2 cup corn syrup, 1/2 cup unsalted butter and 1/2 tsp salt. Allow it to come to a boil over med-high heat and leave for 5 minutes without stirring. Pull off the heat and add 1 teaspoon baking soda and the vanilla mixture. (The mixture will be extremely hot so be careful.) Pour over the popcorn and stir quickly to coat everything. Divide onto 2 to 3 parchment line cookie sheets, sprinkle with fleur de sel and put in the oven for 1 hour. Stir occasionally to further coat the popcorn evenly with caramel. Remove, allow to cool and store in an airtight container. 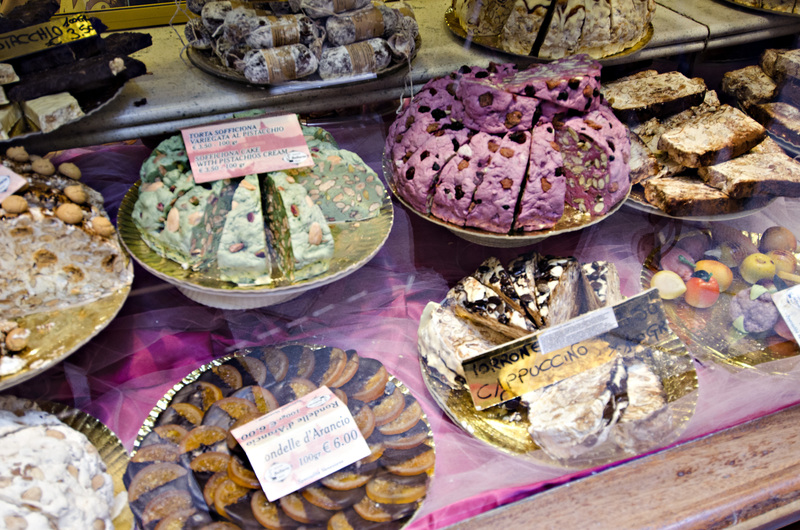 I might possibly be the only food-loving traveller in Italy who actually lost weight while I was there. Not being able to eat gluten had its challenges in a country that has made an art of pasta, pizza and pastries. I made up for not being able to eat pasta by eating a lot of the local seafood dishes, grilled veggies and fabulous salads that are served ubiquitously. I made up for pizza by order a large gluten-free pizza from Panago when I got home – but the pastries were the ones that really got me. I stood longingly before many, many bakery windows staring and salivating at all the wonderful pastries. * If almond flour is not available at your market, you can grind up blanched, slivered almonds in a food processor until finely ground. I would start with a little more than 1 1/3 cups, perhaps 1 1/2 cups. Our local Whole Foods carries a Bob’s Red Mill brand of finely ground almond flour which is what we used for this recipe. 1 Preheat the oven to 350°F (175 °C). Place a round of parchment paper on the bottom of a 9-inch springform pan, and grease it and the sides of the pan with butter or cooking spray. 2 In a large bowl, beat together with a wooden spoon the egg yolks, lemon zest, and 1/4 cup sugar until smooth. 3 In a separate bowl, whisk together the almond flour, ground cardamom, and baking powder. Add the flour mixture to the egg yolk mixture and beat until smooth. 4 With an electric mixer with a very clean bowl and clean whisk attachment, beat the egg whites, starting on low speed and gradually increasing the speed. When bubbles start to form, add a pinch of salt and the teaspoon of vinegar (both the salt and the vinegar will help the beaten egg whites maintain better structure, as will the sugar in the next step). As the egg whites begin to increase in volume, sprinkle in the remaining 1/4 cup of sugar, a little at a time, as you continue to beat the eggs whites. Beat until soft peaks form. 5 Fold the beaten egg whites into the almond mixture a large scoopful at a time. You won’t get much lift with the first third of the egg whites, but as you add more, you’ll be able to gently fold in the whites in such a way as to create a light batter. 6 Gently scoop the batter into a the prepared springform pan and place in the oven. Bake for 35 minutes. Remove from the oven and let cool. Run a sharp knife around the edge of the cake helping it to separate from the side of the pan. Release the springform pan sides, and gently move the cake (on parchment) to a cake serving plate. Sprinkle with a little powdered sugar before serving. These cookies are a Gluten Free adaption from my friend Bonnie who posts all kinds of delicious things over at her and her sister’s blog called Shiny Tomato. Wheat-eaters visit Shiny Tomato for the details – there are a few important differences for the GF crowd. Preheat oven to 350°F. Spray baking sheet with non-stick spray. Whisk first 6 ingredients together in a medium bowl. Using an electric mixer, beat the sugar and Earth Bound in large bowl until fluffy. 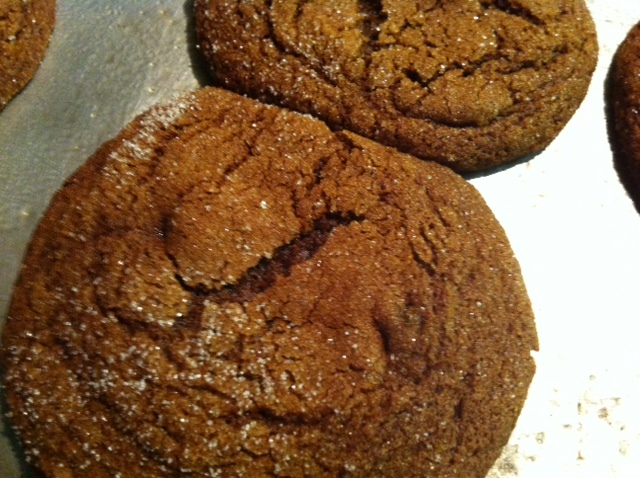 Beat in molasses, vanilla, egg, and fresh ginger. Stir in crystallized ginger, then dry ingredients. Refrigerate for an hour to stiffen dough. Fill small shallow bowl with sugar. Shape 1 teaspoonful of dough into ball; roll in sugar. Place on prepared sheet. Repeat with remaining dough, spacing cookies 2 inches apart. Bake cookies for approximately 11to 12 minutes until golden and dry-looking. Cool on sheets. Alternately, you can freeze the dough and roll it into balls later after un-thawing it. Enjoy! I love the bits of candied ginger in these! These are aweome. 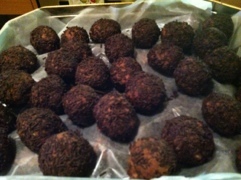 I gluten-freed them from the original recipe which I found on http://www.cooks.com. Combine bananas, eggs, sugar and butter until well blended. Stir in blueberries and vanilla extract. Combine flour, baking powder, cinnamon and salt. Carefully add flour mixture to banana-blueberry mixture. Spoon into muffin cups. Bake in 350 degree oven for 25-30 minutes or until golden brown. Thanks to the awesome folks at Cooks.com and you can get the standard version (that is wheat and butter) of the recipe right here.